Toronto Pearson International Airport, situated in the city of Toronto, Ontario, is a gateway to the Greater Ontario Area. In 2016, Toronto Pearson International Airport handled 44,335,198 passengers, which makes it the second-busiest airport in North America. Toronto Pearson Airport (IATA code: YYZ) is the largest and busiest airport in Canada and the hub airport of Air Canada. Flights to Toronto Pearson Airport are provided by international airlines such as Saudi Arabian Airlines, Cathay Pacific Airways and British Airways. YYZ is a 25-minute drive or a 10-minute train ride from Toronto’s city centre. Book your cheap flights to and from Toronto Pearson International Airport online! Toronto Pearson International Airport, officially named Lester B. Pearson International Airport is an international airport serving the city of Toronto. 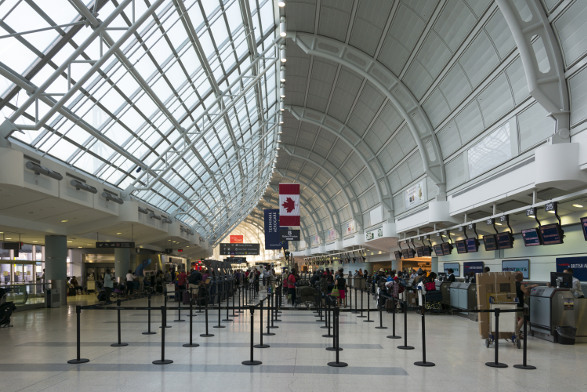 Toronto Pearson is Canada’s front door, each year, the amount of passengers increases. In 2016, over 44 million passengers passed through the airports bustling terminals. There are two active public terminals, Terminal 1 and Terminal 3, equipped with the best facilities. Terminal 1 is home to the ThyssenKrupp Express Walkway, which is the world’s fastest moving walkway. Toronto Pearson International Airport has a great variety of food and drink options available for everyone! Take the time to explore the various cuisine options at restaurants, bars, sushi bars, juice bars, delis, a farmer’s market and cafés. Airport patrons can have the time of the lives at the shops at Toronto Pearson International Airport. Shop at duty-free stores, which include wine, cosmetics, jewellery, clothing and shoes. The international departures terminals at Toronto Pearson International Airport has luxurious lounges, including Plaza Premium Lounge, Air France KLM Lounge, American Airlines Admirals Club and Air Canada Maple Leaf Lounge. Toronto International Pearson International Airport has a range of amazing facilities, including Interfaith centres, banking, luggage and coat storage, a medical clinic and a pharmacy. The Comfort Inn Toronto Airport hotel is an economical and convenient place to reside in, upon your travels to the city of Toronto. It is a 9-minute walk from Toronto Pearson International Airport. Amenities include free Wi-Fi, a business centre, free airport shuttles, a restaurant and cocktail lounges. The Westin Toronto Airport oozes with modern style, it offers a gateway to the best attractions. It is a 5-minute drive from Toronto Pearson International Airport. Amenities include an airport shuttle, parking, internet access and a restaurant. Guests can unwind at the environmentally friendly Hilton Garden Inn Toronto Airport. It is a 4-minute drive from Toronto Pearson International Airport. Amenities include a business centre, meeting rooms, a pavilion lounge and a pool. CIBC and ICE outlets as well as “Travel Cash 2Go” services can be found at Toronto Pearson International Airport. Toronto Pearson International Airport has a wide range of parking options for travellers. Parking options include valet care, express park, daily park, covered parking, Cell Phone Lots and the Value Park Lot. Enquire on the airport website for the best parking options designed for your specific needs. Toronto Pearson International Airport is located 14 km northwest of Downtown Toronto. Car rentals, Uber, Terminal Link trains, metered taxis and limousine options are available to transport you from the airport to your destination!